NL1150 is a small I.D. hose that is recommended for heavy duty air or water (not food grade) in service stations, repair shops, garages, and other areas where abuse, theft, and vandalism are a problem. Its wire braid provides excellent resistance to punctures or cuts and prevents thieves from cutting inflator gauges off of hoses. 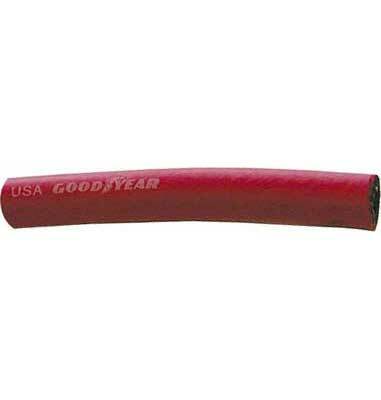 This hose is an economical alternative to standard one wire hydraulic hoses which are sometimes used. Assemblies listed below have crimped solid male NPT ends (-69) or a female swivel by male NPT & bumper which can be used on hose reels (-80). Typical Fittings: N400-BR brass barbs, brass FBL ferrules. Construction: Tube: Black, nitrile blend. Cover: Smooth, red, nitrile blend. Reinforcement: One steel wire braid.